Looking for Pretty Food Ideas for Valentines Day? Some of these are beautiful, one is wacky, one is not so successful. My heart just melted. But I’ll show you how yours will be successful. 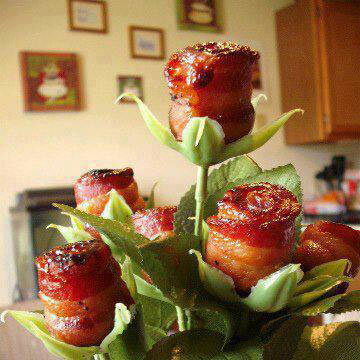 For starters, how about bacon roses? That’s right. 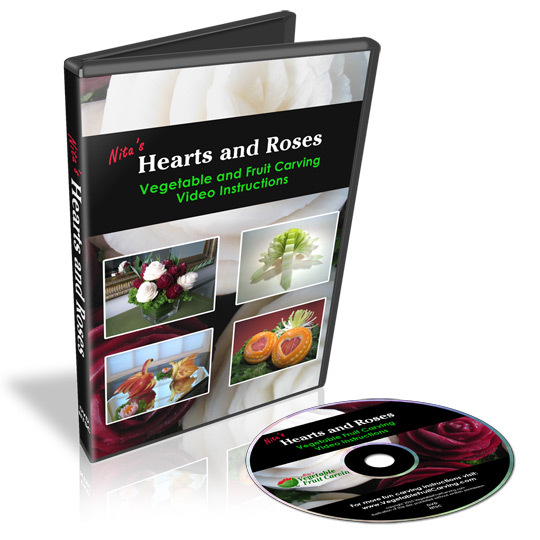 You will find fruits and vegetables carvings in the shape of roses all over my website. But, I’ll bet you’ve probably never seen roses made from bacon! I wish I could give credit to someone for this original idea but I got this photo from a fellow fruit carver, Carl Jones, who got it from a friend who got it from who knows where. It’s so fun, I had to share it. Take a look. Looks like you can rip the roses off their stems. Roll up some bacon and attach it with a toothpick where the roses were. Don’t let all those rose petals go to waste. Scatter in and around a hot bath or make a trail of them leading to the bedroom, or some other such romantic gesture. If your roses were grown without pesticides, you can add them to a salad to add some unexpected color. Rose petals are edible. Or you could use plastic rose stems from a craft store like Michaels. For a pretty food idea for Valentine’s Day in the red/pink and white theme, here is a beautiful bouquet made from radishes. It’s one of the lessons that I teach in my Vegetable and Fruit Carving 101 Course for Beginners. Student Lino Hermano made this and sent me his photo. I think he did a great job. Isn’t it lovely? 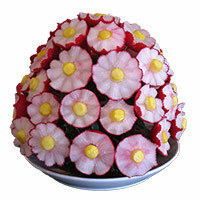 Here is another angle of the same carved radish flower bouquet. 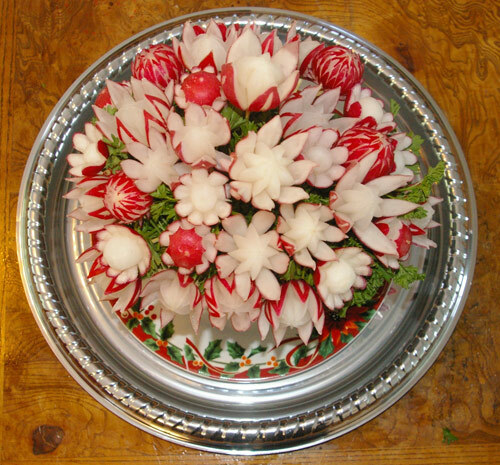 This carved radish bouquet made by Lino Hermano is one of the lessons taught in Nita’s Vegetable and Fruit Carving 101 Course for Beginners. 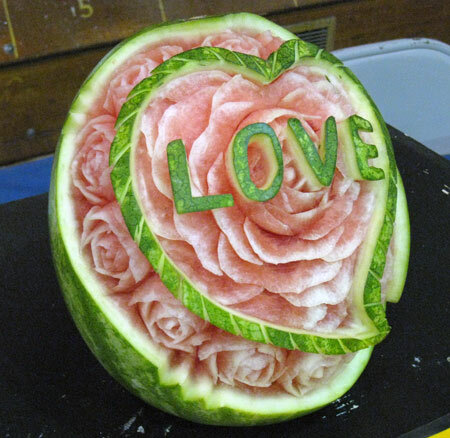 If you already have the skills to carve watermelons with roses, maybe you’ll want to try out this design carved by a student at the U.S. Collegiate National Championships in 2010. Your sweetheart might just love it. 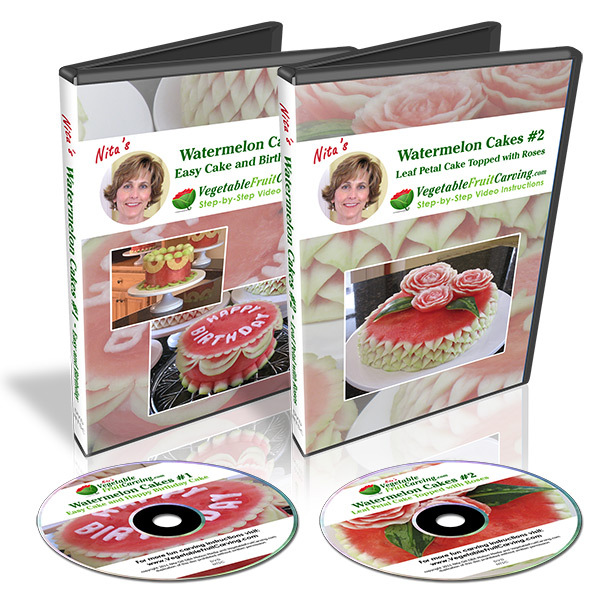 If you want to learn how to carve roses into watermelons, I also teach that in my Vegetable and Fruit Carving 101 Course for Beginners. The lesson is also available separately and is called, Carving Watermelons – Roses, Buds and Leaves. Would you rather make pretty food for Valentines day with candy? 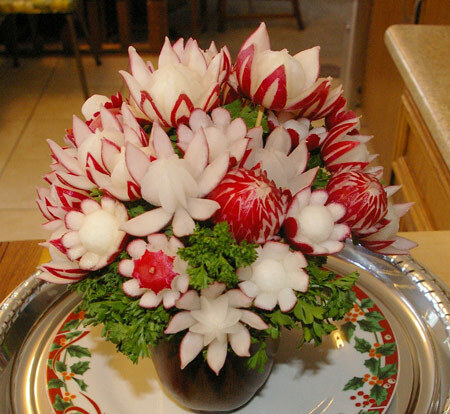 You can use the same candy platter ideas that I demonstrated in December for Christmas. The idea still applies ever though it’s no longer Christmas. 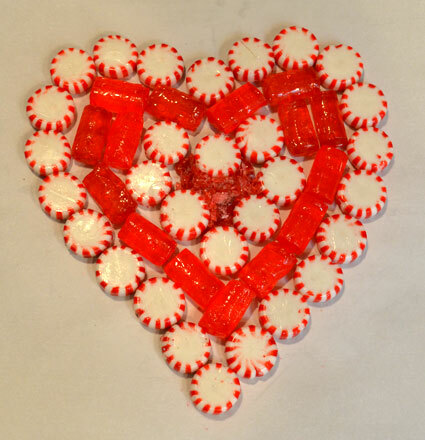 Stick to red and white hard candies to keep it in the Valentine’s Day theme. 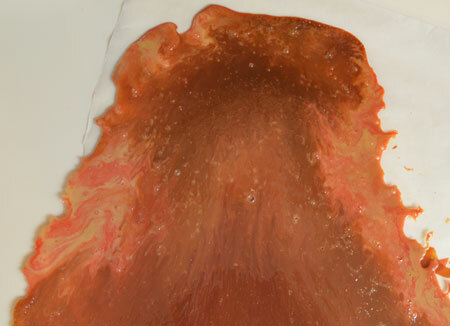 You can watch the video showing how to make a hard candy serving plate on my previous blog post. 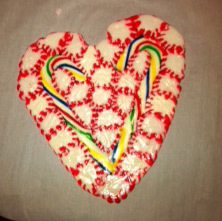 I thought it would be great to show you how a hard candy made with peppermints and red Jolly Ranchers would look. It ran out to the store, bought the candies and set it up like this. Peppermint and red Jolly Ranchers all set up to make a candy serving plate. I crushed the candies in the middle so that would fit in the center of the heart better. Then I put them into the oven to melt knowing that I would have to watch the timer. Well….I got distracted, left the room and forgot about them. This is what happened when I left it in the oven too long. My Melted Heart. This is what happened when I forgot about it and left it in the oven too long. Is a melted heart better than a broken heart? Actually, I thought the way the colors ran looked kinda pretty. That was a failure and I have no time to do it over so I’ll show you a photo of a candy heart plate that my step-daughter made at Christmas time. The heart design works well with candy canes, too. Just remember not to leave the kitchen while your candy heart is in the oven! Anyway, there are a few more pretty food ideas for Valentines Day. I hope you got a smile out of it and maybe even an idea you can put to use for your Valentine’s Day celebration. If you have pretty food ideas for Valentines Day that you would like to share, let me know. MAM REALY FENTASTIC BUT DID NOT UNDERSTAND THAT Bacon Roses! I got a kick out of the “melted heart”. It gets to that point very quickly! The good thing about that is, you get to EAT that one immediately!